Another Summer season has ended and we now prepare for a beautiful Fall season in New England. Fall means school children, school buses, and additional traffic on the roadways. The professional drivers of J & S Transport need to take extra caution when sharing the road to protect our country’s most precious commodity; our children. After much anticipation, J & S Transport has moved into the new corporate office. We can all agree how professional the new building looks. We ask that all employees do their part to keep there work areas clean and bright. Once the expansion of the yard is complete, we will eliminate the need to back across Washington Street into the yard. We want to welcome our newest professionals to the Team! Driver Matthew Kutcheid and Evening Dispatcher Christian Salinder. Matt comes to us with many years in the petroleum transportation industry. Christian is a Licensed Coast Guard 3rd Mate having vast experience with ocean going tankers (Oilers) and transfering cargo from ship to shore. We look forward to having both Matt and Christian on our Team! In addition to overseeing the construction work and the daily affairs of his and Sharon’s company, John Hamel has been quite involved with MA Motor Transport Association. John is a member of the Executive Committee and serves as First Chair. He is also Chairman of the Legislative Committee. John was heavily involved in the updating of the Association’s by-laws. 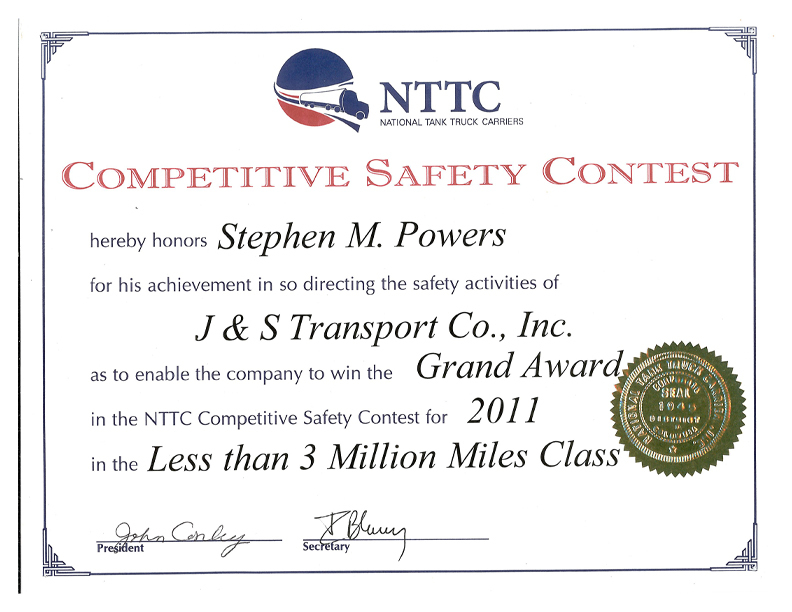 Safety Steve was made Chairman of the MA State Truck Driving Championship Committee for 2014. In addition, Steve was nominated and elected as the Eastern Region Chairman for the National Tank Truck Carrier Safety and Security Council for 2014. 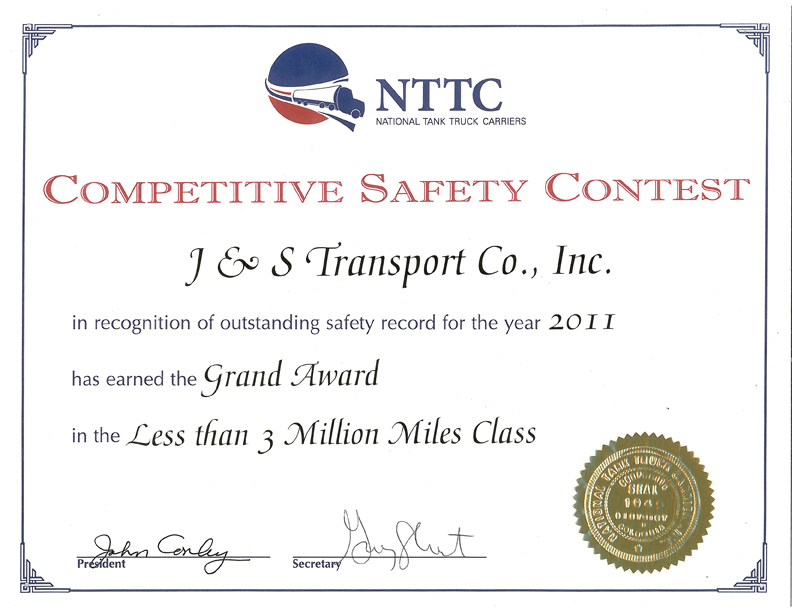 J & S Transport is now becoming a major player in the Transportation Industry; both locally and nationally. • Do not block the crosswalk when stopped at a red light or waiting to make a turn. Blocking the crosswalk forces school children to go around your vehicle, putting them in a dangerous situation. • Always stop when directed to do so by Safety Patrol Officer or Crossing Guard. • Children are the least predictable and most difficult to see. They are very comfortable with their surroundings making them more likely to take risks, ignoring hazards or failing to look both ways when crossing the street. Take extra care to look out for children in school zones, residential areas, playgrounds and parks. • It is illegal to pass a school bus stopped to load and unload children in all 50 States. • School buses use yellow flashing lights to alert motorists they are preparing to stop to load or unload children. Red flashing lights signals the motorist the bus is stopped with children getting on or off the bus. • All 50 States require traffic in both directions stop on undivided roadways when children are entering or exiting a school bus. • The area 10’ around a school bus is where children are in the most danger of being hit. Stop your vehicle far enough from the bus to create the space for children to safely enter or exit the bus. • Never, ever pass a school bus on the right. It is illegal and could have tragic results. How About Sharing the Road with Bicyclists? • When passing a bicyclist heading in the same direction, slow down and leave at least a distance of 3 feet between your vehicle and the bicyclist. Maintain this clearance until safely passing the bicycle. If you are traveling on a narrow, winding road, do not attempt to pass until you can clearly see vehicles approaching you in the opposing lane. Pass the bicyclist only when safe to do so. • The most common cause of collisions are drivers turning left in front of an oncoming bicycle, cutting across the bicyclist’s path. • When you are making a left hand turn and there is a bicyclist entering the intersection from the opposite direction, let the bicycle pass before making the turn. • When you are making a right turn and the bicyclist is approaching on the right, let the bicycle go through the intersection prior to making your turn ensuring you use your turn signals. • Watch for riders turning in front of you without looking or signaling, especially if the bike rider is a child. • Take extra peecautions in school zones and neighborhoods where children may be riding. • Watch out for bikes coming out of driveways, parked cars or other blind spots. • Check side view mirrors for approaching bicyclists before opening the door to your vehicle. You do not want a collision caused by opening a door in the path of the bicyclist. Preheat oven to 375° F. Lightly grease a large baking sheet with 1 tsp of oil. Heat 3 tsp of olive oil in a sauté pan and cook onion, garlic, red and green pepper over a medium flame until soft, for approximately 3 minutes. Turn off heat and remove pan from stove; allow to cool for 5 minutes. In a large mixing bowl, add the ground turkey, egg, breadcrumbs, tomato sauce, chili, chili sauce, frozen corn, cumin, chili powder and cayenne pepper, salt and pepper. Mix well to combine all ingredients. In a small bowl, prepare the topping by stirring together all of the ingredients. Add the sautéed veggies to the turkey mixture and combine well. Transfer the mixture onto the sheet pan and form into a rectangular loaf. Pour the glaze over the top and spread evenly. 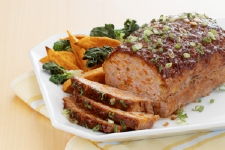 Place a sheet of aluminum foil loosely over the top of the meatloaf and place in the oven for 30 minutes. Remove the foil after 30 minutes and continue to cook for an additional 15 minutes. Remove from oven, slice and serve.